iLuv iMM727 review | What Hi-Fi? The iLuv brand has had a chequered history in this magazine. Most recently, the company scored a five-star write-up with the £40 iMM289, which proved simple but effective for the money. The iMM727 – aka ‘The ArtStation’ – , while not exactly at the other end of the price spectrum, has many more features. 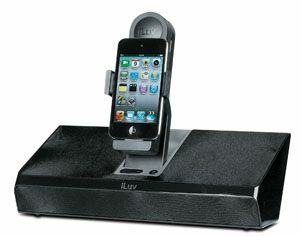 Thanks to the adjustable, rotating dock, it works with iPads, iPhones and iPods, while in addition to the usual 3.5mm analogue stereo input there's also a USB connection, the latter letting you connect to your computer to sync a docked iOS device. Also on offer is the a free iLuv App, allowing your Apple handheld to function as an internet radio tuner when docked, and also deliver functions including weather information and an alarm clock. Sadly, though, the sound is lacklustre. DJ Shadow’s Scale It Back lacks punch, while there’s little of note when it comes to bass. The extras are nice, but your tablet deserves better.